The Standard of Excellence Comprehensive Band Method is our highly successful performance-centered band method, and it is used in hundreds of band programs worldwide. The full series consists of Books 1, 2 and 3. 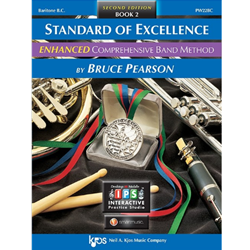 The ENHANCED version of the original Standard of Excellence Comprehensive Band Method augments Books 1 and 2 with unique interactive technology. The content of the original and the ENHANCED versions is the same, retaining the clarity of presentation and unsurpassed pedagogy and music that has made Standard of Excellence the world's best selling band method. The ENHANCED features includes: Full color drawings and graphics. Three starting systems to help ensure positive results in any beginning situation. FOR ... ONLY exercises (i.e. FOR FLUTES ONLY) that offer idiomatic solutions to the unique challenges of each instrument. EXCELLERATORS (advanced supplemental exercises) to reinforce and enrich performance basics. A nine page FOR OBOES ONLY starting system that gives beginners a solid foundation for learning in the full band setting. Expanded French Horn and Percussion books, including a separate book for Timpani & Auxiliary Percussion, that address the unique needs of beginners on these instruments. A comprehensive, totally-correlated Electric Bass book that offers expanded opportunities for student involvement. Music from over 20 countries, with correlated enrichments, to encourage multicultural study. Achievement Lines and GO FOR EXCELLENCE! test lines to ensure objective assessment of students' accomplishments. A built-in reward system that motivates students and encourages musical growth. Personalized access to all the features of the INTERACTIVE Practice Studio. Also, all three Standard of Excellence Comprehensive Band Method books are supported by Smart Music © . Books 1 and 2 combine a strong performance-centered approach with music theory, music history, ear training, listening, composition, improvisation, and interdisciplinary and multicultural studies. The result is the most complete band method available anywhere! Book 3 is an intermediate level band method that introduces students to Western Music History. Students learn performance and technical skills within the appropriate historical context. While only available in the original version, Book 3 can be used following the ENHANCED version of Books 1 and 2.